The four-cylinder isn't even the least powerful engine in the lineup. It's more potent than the standard V6. Chevrolet saved a big surprise about the 2019 Silverado 1500 to just before the pickup's debut. The LT and RST trims come standard with a new 2.7-liter turbocharged four-cylinder. It's a decision that's sure to raise eyebrows among the truck enthusiasts who are used to six- and eight-cylinder powerplants. The turbocharged four-cylinder produces a potent 310 horsepower (231 kilowatts) and 348 pound-feet (472 Newton-meters), and it comes exclusively with an eight-speed automatic. This output means the turbo mill is quite a bit more powerful than the 4.3-liter V6 with 285 hp (213 kW) and 305 lb-ft (414 Nm), which comes standard on the Work Truck, Custom, and Custom Trail Boss trims. Chevy still expects over half of Silverado buyers to pick a V8, and there are two options for these folks. Both now feature 17 different modes of cylinder deactivation. The 5.3-liter makes 355 hp (265 kW) and 383 lb-ft (519 Nm) and comes with either a six- or eight-speed automatic. It's standard on the LT Trail Boss, LTZ, and range-topping High Country models but an option on all other trims. The top of the range is a 6.2-liter V8 that produces 420 hp (313 kW) and 460 lb-ft (624 Nm). It comes with a 10-speed automatic and is available as an option on the LTZ and High Country. In early 2019, Chevy will add a 3.0-liter inline-six turbodiesel with a 10-speed automatic to the lineup. However, specs for it aren't available for the powerplant yet. 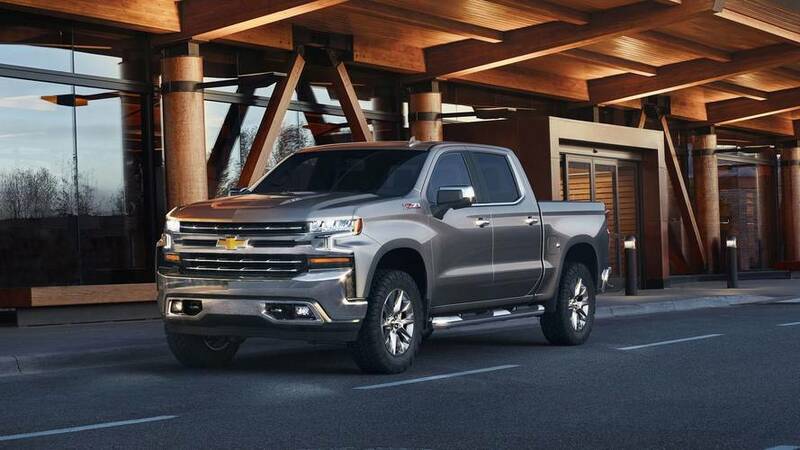 Chevy unveiled the 2019 Silverado earlier this year at the 2018 North American International Auto Show in Detroit. The engineers put an emphasis on cutting weight by using more high-strength steel and aluminum for the doors, hood, and tailgate. The result of this work shed up to 450 pounds (204 kilograms) over the previous generation, despite being physically larger. The company will start production of the V8 Silverado with a crew cab in the third quarter. The V6, turbo four-cylinder, and other body styles will arrive in the fourth quarter. There are no pricing details yet. 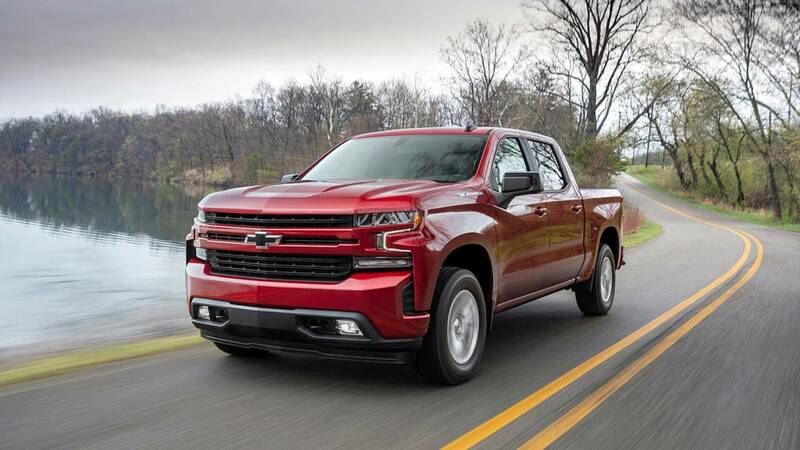 DETROIT — With eight trims paired with six engine/transmission combinations, even more customers will find a 2019 Silverado 1500 perfectly tailored to their needs for performance, efficiency, technology and value. Over half of the models will be equipped with the most advanced V-8s in the brand’s history: updated versions of Chevrolet’s proven 5.3L and 6.2L engines equipped with industry-first Dynamic Fuel Management featuring 17 different modes of cylinder deactivation. An all-new, advanced 2.7L Turbo engine that replaces the 4.3L V-6 as the standard engine on the high-volume Silverado LT and new Silverado RST, expected to offer 22 percent more torque, greater fuel efficiency and a stronger power-to-weight ratio than the current model. Proven 4.3L V-6 and 5.3L V-8 engines deliver full-size truck capability and performance for the most affordable trucks in the Silverado lineup. An all-new, Duramax 3.0L inline-six turbo diesel will be available in early 2019. Each engine/transmission combination is matched with exterior design and interior features to create distinct personalities for each Silverado trim, based on three broad customer profiles: High Value, High Volume and High Feature. Standard: 4.3L V-6 with Active Fuel Management and a six-speed automatic transmission (SAE-certified at 285 hp/305 lb-ft). Available: 5.3L V-8 with Active Fuel Management and a six-speed automatic transmission (SAE-certified at 355 hp/383 lb-ft). Standard for LT and RST: All-new 2.7L Turbo with Active Fuel Management and stop/start technology paired with an eight-speed automatic transmission (SAE-certified at 310 hp/348 lb-ft). Standard on LT Trail Boss and available on LT and RST: An updated 5.3L V-8 with Dynamic Fuel Management and stop/start technology with an eight-speed automatic transmission (SAE certified at 355 hp/383 lb-ft). Available on LT and RST: The all-new Duramax 3.0L Turbo-Diesel with stop/start technology paired with a 10-speed automatic transmission will be available in early 2019. Standard: Updated 5.3L V-8 with Dynamic Fuel Management and stop/start technology paired with an eight-speed automatic transmission (SAE certified at 355 hp/383 lb-ft). Available: Updated 6.2L V-8 with Dynamic Fuel Management and stop/start technology paired with a 10-speed automatic transmission (SAE certified at 420 hp/460 lb-ft). Available: The all-new Duramax 3.0L inline-six Turbo-Diesel with stop/start technology paired with a 10-speed automatic transmission will be available in early 2019. The performance of each engine/transmission combination benefits from a truck that is lighter and more aerodynamic than the previous model. 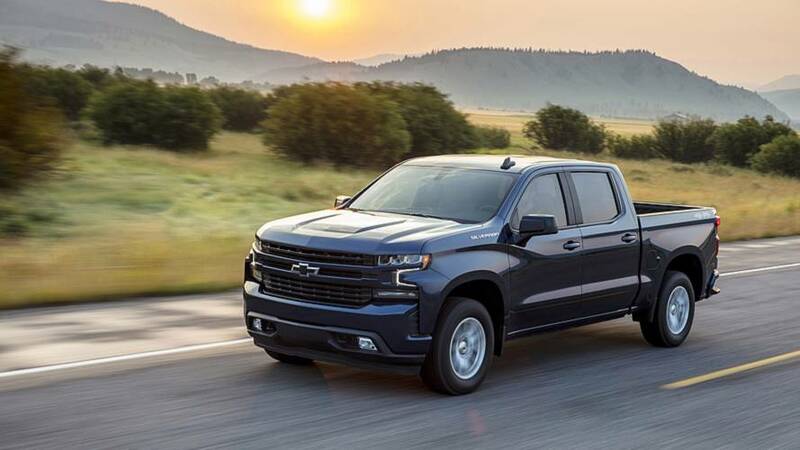 The 2019 Silverado is larger than before, including a wheelbase that is up to 3.9 inches (100mm) longer, yet overall length is only 1.6 inches (41mm) longer, enabling both more cargo volume and more interior room for all cab lengths. Remarkably, it’s also lighter, weighing up to 450 pounds (204 kg) less than the current Silverado when comparing crew cab V-8 models, due to extensive use of mixed materials and advanced manufacturing. 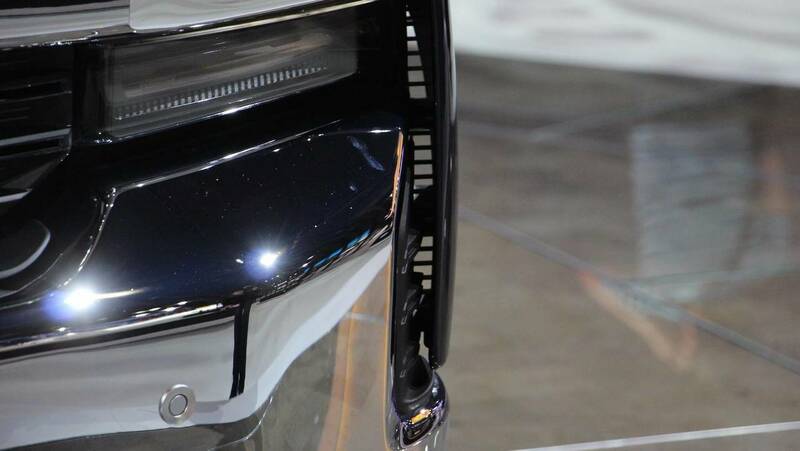 To improve the aerodynamic efficiency of the next-gen Silverado, the front grille features functional air curtains, similar to those introduced on the sixth-generation Camaro, that reduce wind drag by routing air around the front wheel wells. The powerful side profile also enhances aerodynamics, with an integrated spoiler at the rear edge of the cab that directs air onto the contoured tailgate, reducing wind drag from the bed. Most models also feature active aero shutters integrated in the front grille that close to reduce wind drag and open to provide improved engine cooling when needed. Changes like these result in a 7 percent increase in total aerodynamic efficiency. For the new Silverado, Chevy set the lofty goal of improving on the legacy of the Most Dependable, Longest Lasting full-size pickups on the road. To do so, the next-gen truck will be subjected to more than 475,000 validation tests and accumulate a staggering seven million miles of real-world testing before the first 2019 Silverado 1500 is delivered to customers. Each type of engine was first subjected to a “torture test” in a dynamometer test cell, running for months nonstop to simulate a lifetime of maximum hot and cold cycles. Each Silverado variant is certified to the SAE J2807 standard for towing and payload capacity. Certification requires a full battery of grueling tests such as the Davis Dam test, in which the truck must carry its maximum gross combined vehicle weight up a 7 percent grade in 110-degrees F (43 degrees C) heat, with no reduction in performance, including air-conditioning. Chevrolet engineers prove every Silverado engine and transmission design for lubrication capability on tilt stands, originally developed for Corvette, that tilt at an angle of up to 53 degrees and can simulate angles at a rate of up to 40 degrees a second — the equivalent of up to 1.4g. Silverado production commences with crew-cab V-8 models starting in the third quarter. In the fourth quarter, production will expand to include regular- and double-cab models, as well as V-6 and 2.7L Turbo engines. The new Duramax 3.0L inline-six turbo diesel will be available in early 2019. EPA fuel economy estimates and towing/payload capacities are not yet available, and will be announced closer to launch.